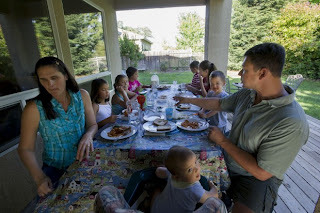 Dr. Jessica Light, 43, a veterinarian and her husband, geologist Jeff Light enjoy dinner on the backyard porch with their seven children, ages 6 months-13 years old, at their home in Rancho Marietta, Calif. These women are bucking the trend. Stefanie Anderson, 42, who is pregnant with her first child, conceived through in vitro fertilization; Jessica Light, who gave birth to her seventh child six months ago; and Christine Krause, 42, whose newborn son, Maxwell, was a "surprise" addition to the family but no less a blessing. Women in their 40s may be better equipped than their younger counterparts to handle the stresses of bringing a new life into the world. "Older women seem to enjoy their babies more," Ruth Haskins, the obstetrician, said. "Their careers are more established. Maybe they can afford nannies. They have broad social networks. They seem more patient. Some of them have waited a long time, so they really, really appreciate their babies."